Tunes Urbs - Braun & Hogenberg. Map maker : Braun & Hogenberg.. Size : 12.6 x 16.3 inches. / 32.0 x 41.5 cm. Description :Attractive city view of Tunis in Tunisia / Africa. 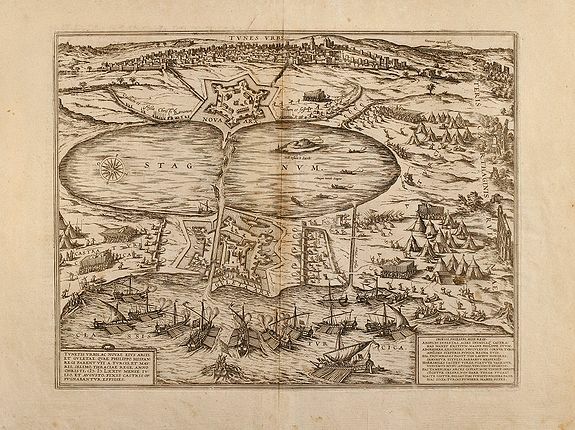 Showing the Imperial attack on Tunis in 1573. Latin text on verso. Condition : Minor overall toning, small tears in margin, one small tear (1.5 cm) in engraving repaired, small hole in margin (upper left corner).